Branched, pleasant-smelling, hairy, somewhat prickly perennial shrub up to 3 m tall in warm places in North Auckland. Small, tubular flowers in tight bunches, of variable colour, usually changing from cream or yellow to pink, purplish-pink or rose. Flowers Rose and yellow, up to 1 cm in diameter, fragrant. Corolla tubular, with four backward-curved lobes, in dense inflorescences on slender stalks up to 10 cm long in the leaf axils. Flowers Jan-Dec.
Fruit Poisonous, juicy round drupes (berries) about 5 mm in diameter. Drupes initially green, ripening to deep purple or black. Leaves In opposite pairs, crinkled, with rough hairs on the upper surface, soft hairy underneath. Leaves bluntly-toothed, egg-shaped or heart-shaped, up to 13 cm long by 7 cm wide, on stalks up to 2 cm long. Stems Square, with a pithy core. Erect to spreading or scrambling, usually with curved-back prickles. Road-sides and waste places in warm districts. NI only, locally abundant on the north-west shore of Hokianga Harbour, occasional elsewhere in North Auckland, Auckland (Rangitoto Island) and Bay of Plenty (as far east as Opotiki district). Originally from tropical America. 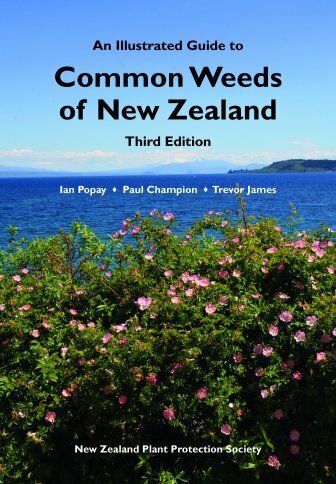 In many parts of the tropics, this species is a dangerous weed, being poisonous to livestock, although it has never been a problem in NZ. Lantana camara var. 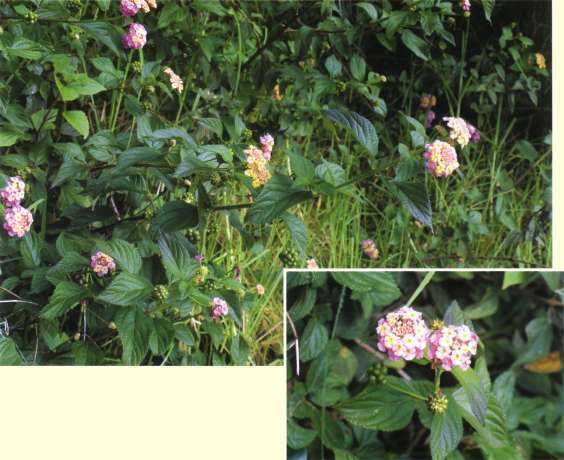 aculeata, the most common variety of lantana found growing wild in NZ, with cream and pink flowers, is listed on the National Pest Plant Accord (see Introduction for details). Other forms and species of Lantana are common garden plants. Lantana (Lat.) = viburnum, named for its similar foliage; camara South American name.